The Aquavar CPC is offered in a wall or floor mounted design up to 550 HP, 460 volt*, single phase input up to 50 HP, 208 230 volt and three phase 208-230 volt up to 100 HP *! The latest software provides more versatility and flexibility with centrifugal pump applications than ever before! With all the available Aquavar Products, Goulds Water Technology provides the pump professional with more options for a complete variable speed pumping system. Pump protection built in! Protects based on RUNDRY, “DEAD-HEADING”, CAVITATION and “RUNOUT” conditions. Motor protection built in! Protects based on OVERCURRENT, OVER/UNDER VOLTAGE, PHASE LOSS, SHORT CIRCUIT, GROUND FAULT, OVERTEMPERATURE. Built-in line choke. Similar to a line reactor, it provides the equivalent of 3% impedance against transient voltage spikes and surges. Reduces harmonic distortion. EMC/RFI filters reduce drive noise interference and emissions. Multi-Pump without additional PLC’s or controls. Automatic Lead-lag and alternation up to four (4) Aquavar controlled pumps. MODBUS® compatible. MODBUS is standard protocol with SCADA networks. Fixed speed control relays. 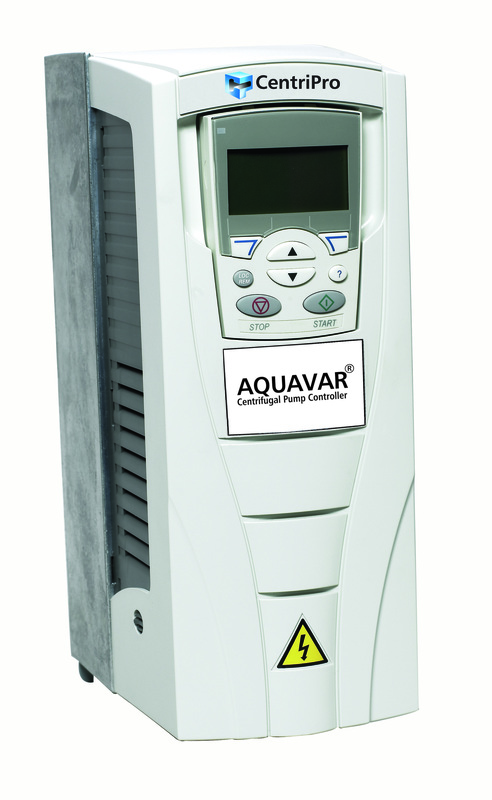 Control up to three fixed speed pumps with one Aquavar CPC with programmable relays (additional motor starters required). Help text and programming “Wizards” to assist with set up. Pressure transducer with shielded cable included. Compatible with some older model Aquavars for existing multi-pump applications. NEMA 1 standard design (indoor), with NEMA 12 and outdoor enclosures available. Dual pressure control with programmable differential pressure starting. *Always check motor full load amps compared to drive rating. Obsolete-Variable Speed Curves 2007 Goulds Pumps 4" Submersibles used with Variable Speed Pump Controllers such as the Balanced Flow or Aquavar CPC. Copyright 2019 Xylem Inc. All rights reserved. We are committed to ensuring that the individuals whose details we hold understand our privacy practices. In particular, we want to make sure that we are respectful of your data protection preferences, and that you understand your data privacy rights. By providing personal data to Xylem, you acknowledge that you have read and understand the terms of our Website Privacy Statement. You can adjust all of your cookie settings by navigating the tabs on the left. Necessary Preference cookies help make our website usable by enabling basic functions like page navigation. The website cannot function properly without these cookies. This type of cookie should be enabled at all times so that we can save your preferences for all other cookie settings. Preference cookies enable the website to remember information that changes the way the website behaves or looks, like your preferred language or the region that you are in. No other personal information is collected. Twitter Widget shows the Xylem brands twitter stream and has a feature for like and retweet. Click here to learn more about how this cookie is managed by Twitter. Facebook SDK shows the Xylem brand timeline and allow visitors to like the fb page and send message to fb page admin. Click here to learn more about how this cookie is managed by Facebook. Please enable Necessary Preference Cookies first so that we can save your preferences! These cookies allow us to count visits and traffic sources, so we can measure and improve the performance of our site. They help us know which pages are the most and least popular and see how visitors move around the site. All information these cookies collect is aggregated and therefore anonymous. This communication provides access to our Privacy Notice. It explains in clear language what information we collect about individuals, how we use it, and the choices and controls you have. We have also recently updated our Privacy Notice to ensure that it meets high transparency requirements for data privacy in compliance with the EU data protection law known as the General Data Protection Regulation (GDPR), which went into effect on May 25, 2018.